EAST LANSING, Mich. (AP) — There’s been little time for Penn State to dwell on its loss last weekend at Ohio State. Another tough matchup looms immediately for the Nittany Lions — maybe the most difficult one they’ll face the rest of the regular season. No. 7 Penn State plays at No. 24 Michigan State on Saturday in a game that looks a lot more intriguing than it did at the start of the season. Like the Nittany Lions, the Spartans are coming off a loss, and the teams are even in the conference standings as they begin the November stretch run. Penn State (7-1, 4-1 Big Ten, No. 7 CFP) can still hold out hope of making the College Football Playoff, even after a 39-38 loss to Ohio State. All the Nittany Lions can do is win their remaining regular-season games and hope for the best — and after facing Michigan State, they have home games against Rutgers and Nebraska, followed by a trip to Maryland. So the toughest part of the schedule may be behind them, but the Spartans (6-2, 4-1, No. 24) could pose a stiff challenge. Michigan State is coming off a wild defeat of its own, a 39-31 loss at Northwestern in triple overtime. The Spartans weren’t expected to be much of a threat this season after going 3-9 in 2016, but they’re still in the Big Ten title hunt with games against Penn State and Ohio State coming up in back-to-back weeks. Michigan State has had problems all season with fumbles. The Spartans have lost 10, which is tied for most in the conference, and Penn State has taken away a league-high 11 fumbles, part of a plus-14 turnover margin that also ranks No. 1 in the conference. 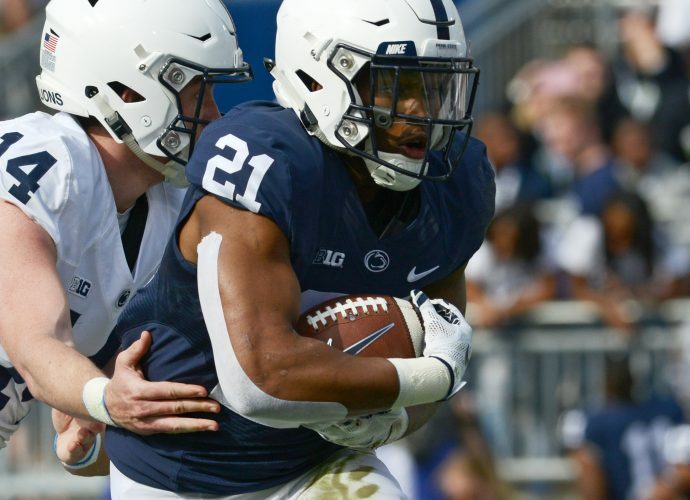 Penn State running back Saquon Barkley has scored a touchdown in 15 straight games, and quarterback Trace McSorley has thrown a touchdown pass in 23 straight. Michigan State has the top-ranked rushing defense in the Big Ten but now must contend with Barkley, who is averaging 100 yards a game on the ground. This is a matchup of the last two Big Ten champions. Michigan State won in 2015 and made the playoff. Penn State won the title last year but didn’t get a playoff berth. Even after the loss to Ohio State, the Nittany Lions have won 16 of their last 18 games. Michigan State has played mostly tight, low-scoring games of late — and that includes the Northwestern game, which was high-scoring only because of the overtimes. Special teams could be crucial this weekend. Barkley is dangerous on kick returns for Penn State, but when the Spartans have to punt, Jake Hartbarger can do a good job pinning an opponent back.